Throwing big! with Mal Sole – 23 September. Workshop poster - throwing big - 23 Sept.
Come along and learn several techniques you can use to go large on the wheel. - This is a demonstration workshop – you will not have the opportunity to throw during the workshop, but can practice the skills during your own time. - Some techniques Mal will demonstrate require a high speed wheel that can handle a heavy load such as Shimpo brand (there is only 1 wheel like this available at the club). 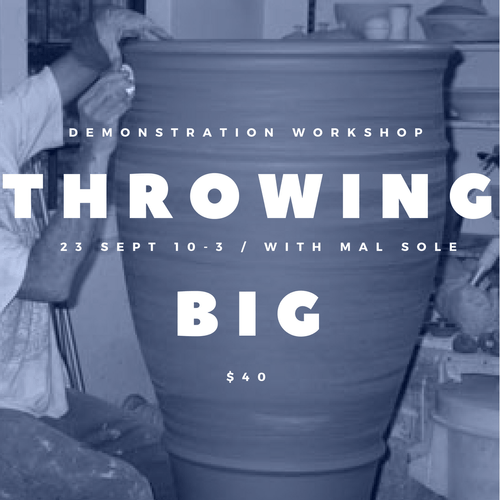 - This workshop is for people with intermediate level throwing skill. You should be able to confidently centre clay and make a cylinder. Space is limited – Register now! $40 payment ($50 non-WPA members) must be received prior to workshop. For more information or if you have any questions please email - workshops@wellingtonpotters.org.nz.